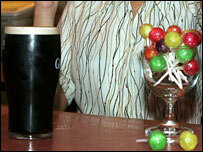 Drinkers in Angus are to be given lollipops when they leave pubs in a bid to cut down on late night noise. The idea, which has already been used as an effective silencing tool south of the border, is now coming to Montrose. The Angus Drugs and Alcohol Action Team, which is behind the plan, said it believes that pub-goers will be less rowdy if they are sucking on sweets. The scheme has come after long-standing complaints from Montrose residents about noise and anti-social behaviour. The consignment of lollipops, paid for by the action team, will initially be handed out by door staff at two licensed premises on the seaside town's town's George Street. Police officers will also have some to hand out to revellers on their way through residential areas to nightclubs and elsewhere. A similar scheme was successfully introduced in Manchester, where lollipops were handed out to people as they left the pubs to cut noise in the city centre. Tayside Police Inspector Athol Aitken said: "People on a night out deserve to enjoy themselves in a safe environment. "Equally, the rights of people who live in the area and do not want to have their privacy shattered must also be upheld."